(Music Sales America). Express yourself through the beautiful voice of the solo guitar. Solo Guitar Playing can teach even the person with no previous musical training how to progress from simple single-line melodies to mastery of the guitar as a solo instrument. Fully illustrated with diagrams, photographs, and over 200 musical exercises and repertoire selections, this book offers thorough instruction in every phase of classical guitar playing. Complete coverage of individual skills includes: Basic technique; Reading music, memorizing, and ear-training; Mastering the fingerboard; Building dexterity and speed; Developing tone color and musical phrasing; Position playing; Interpretation; and more. 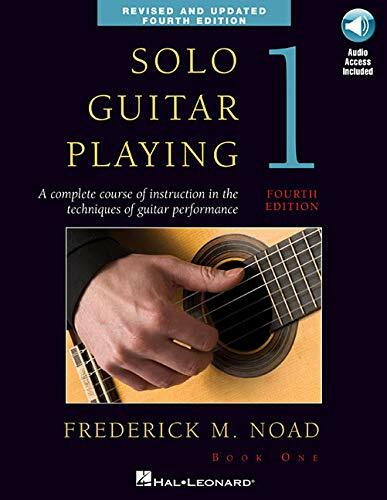 Since its first printing in 1968, Frederick Noad's Solo Guitar Playing has been used by countless students and teachers of classical guitar. The fourth edition features revised and updated exercises and an expanded selection of solo guitar repertoire gleaned from the best-selling Frederick Noad Guitar Anthology.